One of Honda's greatest strengths as a brand is also its signature weakness: it's an unashamedly engineering-led company with a burning aversion to doing anything the same way as its competitors, and which views failure as the acceptable cost of learning to win. So it has been in pretty much every field of Honda endeavour (apart from lawnmower engines), from road cars and motorbikes to the racetrack. In the 1960s it started from nothing in F1, rose to win the last grand prix of the 1.5-litre era, then squandered that momentum by diverting resources to developing an air-cooled 3-litre successor. Company founder Soichiro Honda set this tone from the top, famously remarking that success represents "the 1% of your work that results from the 99% that is called failure", and his many eminently quotable comments in this vein have rendered him a mainstay of management textbooks to this day. But he wasn't wrong: failure is valuable so long as you draw the right lessons from it. 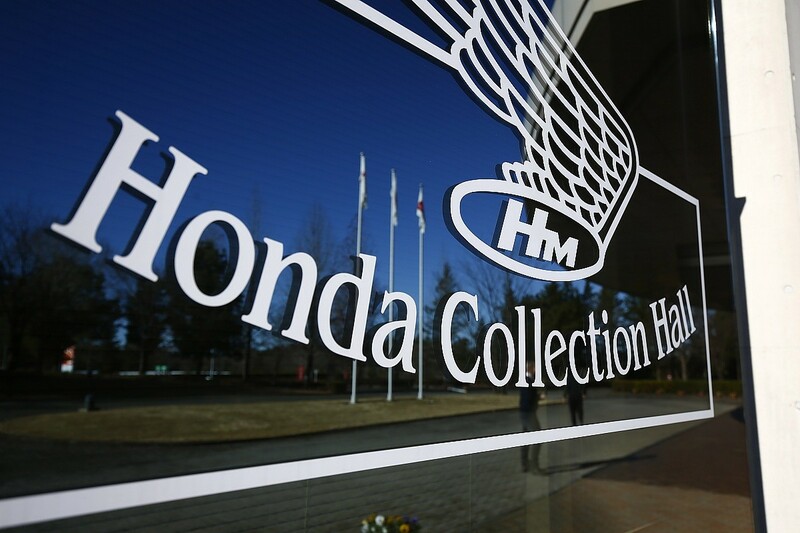 Late last year I attended Honda's annual 'Thanks Day' at Twin-Ring Motegi and seized the opportunity to visit the on-site Collection Hall, home to an extraordinarily broad selection of machinery on two wheels, four and none. No other automotive company can boast (or would confess to) such a broad quixotic streak stretching back to its earliest days, and the Collection Hall accords the development clangers and blind alleys equal reverence to the crushing victories; it's a multi-floor temple of experimental engineering and a fascinating peek into the corporate psyche. 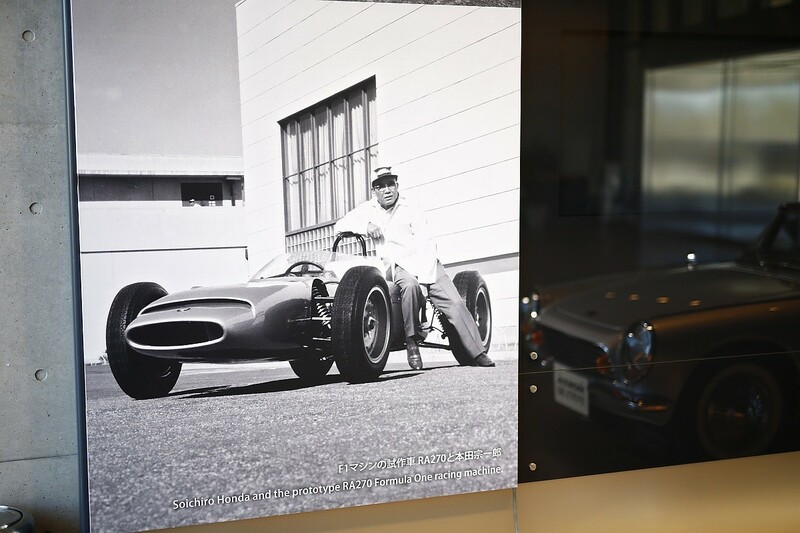 Just inside the door there's a large photograph of a proud Soichiro Honda posing alongside his company's first prototype F1 car, in style and poise much like a portrait you might find hanging in an English country house, perhaps featuring an 18th century lord of the manor attended by a beloved hunting dog. Shortly after it was taken, Mr Honda declared the car not fit for purpose and directed his engineers to start again. He and Steve Jobs, you imagine, were cut from similar cloth. The early 1960s was a febrile era for both Honda and the world at large. In May '61 US President John F Kennedy stood before Congress and committed to out-there missions including putting a person on the moon before the end of the decade, "not because they are easy but because they are hard". In Japan, Honda had gone from improvising motorised bicycles in a shed using war-surplus materials to becoming the world's biggest motorbike manufacturer in 1959, making its debut on the two-wheeled racing scene, breaking ground on a specialist test track at Suzuka, and committing to launching its first road car. By 1962 Suzuka was ready for action, as was the S360, a dainty chain-driven two-door roadster powered by a 360cc four-cylinder engine. 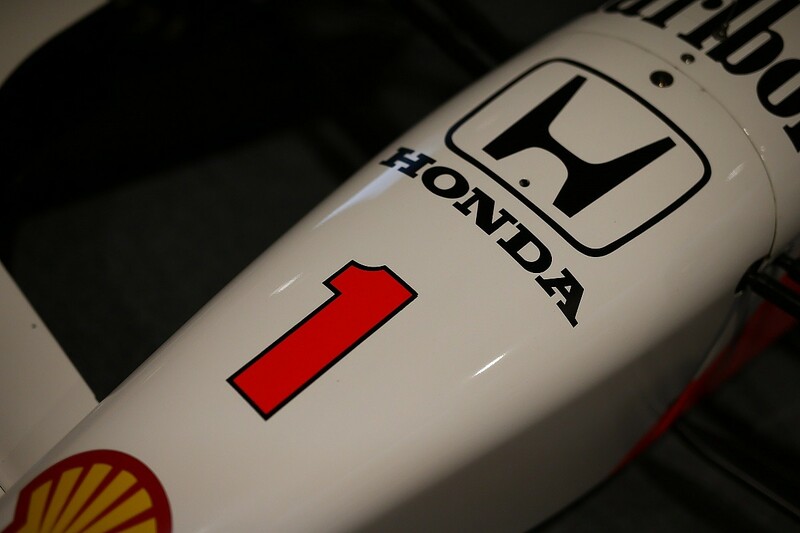 During its development, word came down the line to the company's most senior engineers that Mr Honda had decided to go racing in something called "Formula 1". By and large, they were baffled. Nevertheless, a little over three years later Honda won its first grand prix. Energy in the right places: engines weren't a problem, though hitting Soichiro's plucked-out-of-his-head target of 270bhp was a challenge, and when a putative tie-up with Lotus fell through, the company sourced a spaceframe chassis Cooper-Climax to strip, measure, weigh and analyse with a view to building its own chassis. The result of that was the car Mr Honda is photographed with. 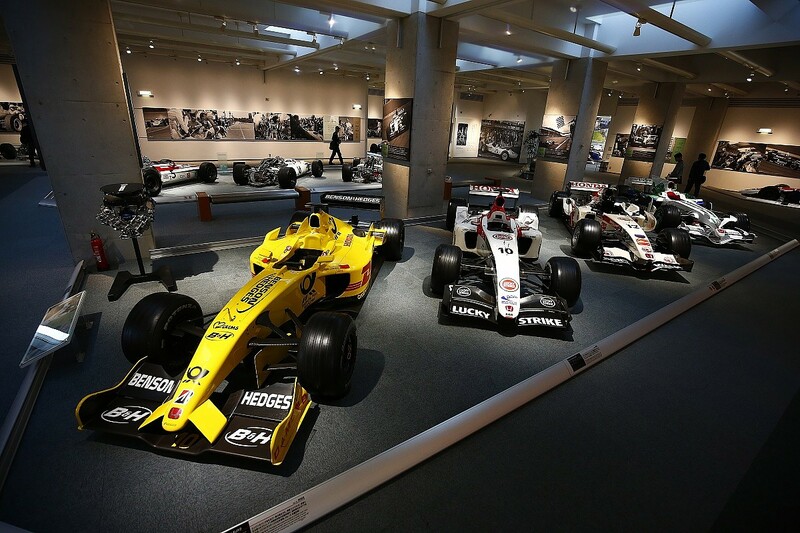 It's fitting that the picture is presently hanging above a replica of the S360 in the Collection Hall foyer; both cars were canned at the boss's command, the S360 in favour of a similar car with a bigger engine, the F1 prototype for a completely new semi-monocoque design. Mr Honda had been scrutinising reports from Europe, seen the effectiveness of the Lotus 25 in the hands of Jim Clark, and recognised that his own prototype was way behind the curve. Honda's relatively brisk path from debut to victory in 1964-65 demonstrates both the virtues and flaws of the company's inbuilt stubbornness. Building its own semi-monocoque chassis without any experience in the necessary stress calculations was bold, as was the decision to power it with a transversely mounted V12, itself an edgy, high-revving design with needle-roller bearings. The only sop to managing expectations was the decision to hire below-the-radar US club racer Ronnie Bucknum to give the RA271 its race debut at the Nurburgring in 1964. Contemporary reports suggest that as the white car was removed from its transporter in the paddock, other competitors greeted it as if it were a UFO. Bucknum, also a newcomer to the 'Ring, qualified a minute off pole and ultimately retired, but the Japanese car and its extraordinarily loud engine had made an impact. The sole RA271 now sits alongside the Cooper-Climax on the first floor of the Collection Hall as a comparison piece. Certainly the Cooper looks bloated and old hat, but the RA271 and its successor still had problems with weight, rigidity and reliability. The V12 engine, too, was reputed to be among the most powerful in F1 - it certainly pinged off the line, especially once carburation gave way to fuel injection in 1965 - but it didn't always last the distance. That changed, unexpectedly perhaps, in the thin atmosphere at Mexico City in 1965 when Richie Ginther surged past Dan Gurney and polesitter Jim Clark at the start in his RA272, and was never headed until the chequered flag. Hiring Ginther, a gifted but under-rated driver known for his strengths in guiding development, was among the wisest decisions Honda made in this era. 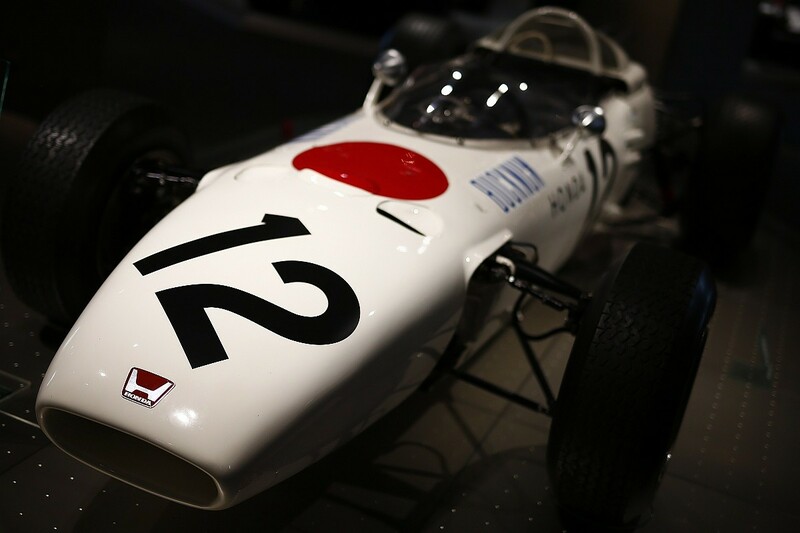 But it wasn't enough to cure the fundamental problems with the chassis, which manifested themselves once more as the three-litre formula came in for 1966 and Honda had to begin the engine-design cycle again. The three-litre 48-valve V12 would come good, but in spite of hiring John Surtees to drive for 1967, relocating F1 operations to a workshop in Slough, and grudgingly entering a chassis-design collaboration with Lola, Honda won just one more race in this period. You'll not find the reason for this in the racing section of the Collection Hall, because the sole remaining RA302 from 1968 is away being restored. Turn instead to the dapper-looking three-box saloon and coupe models in another corner, each powered by a 1300cc air-cooled engine. In '68 Soichiro Honda declared that since in a water-cooled engine the water is eventually cooled by air, via the radiator, his company would henceforth cut out the middleman. It was a technological cul-de-sac that killed the F1 project, but since the order came from the man whose name was above the door, it couldn't be ignored. The F1 team dutifully created an air-cooled V8, but packaging it proved another challenge; Surtees gave the cab-forward, magnesium-bodied RA302 a withering stare, declared it "a deathtrap", and refused to race it. Jo Schlesser's fate in the car's one race, the French GP, bore out that verdict. So Honda's first F1 programme fizzled out at the end of that year with one car (the conventional, Lola-based RA301) starved of development resources and another one that nobody wanted to drive. Honda's wilful desire to go its own way had taken it in utterly the wrong direction. Honda's return to F1, 15 years later, had similarly unpromising beginnings but eventually yielded remarkable success. The Spirit team had enjoyed some success with Honda in the feeder formulas, but when the two embarked in F1 together in 1983 the 201 chassis was a slow, ugly lump, and the RA163-E V6 turbo grenaded itself frequently. The partnership quickly dissolved, but that car - equally inelegant in its boxiness as the engine is with its tangled plumbing out back - now sits in the Collection Hall at the beginning of a line that includes the dominant McLaren MP4/4. An example of the 1988 engine - a bespoke design, created for that season in close collaboration with Gordon Murray's engineers in Woking - now sits on a pedestal by the car that won 15 out of 16 races. It's a palpable example of how effective Honda's creativity and resources can be when pointed in the right direction. The line-up continues through Honda's more chequered recent past. Collaborations with Jordan and BAR that yielded mixed results, albeit one victory. Autosport tech expert and former Jordan technical director Gary Anderson has written often about the challenges he faced in convincing Honda's engineers that its V10 wasn't as powerful as they thought it was. Ross Brawn, drafted in as team principal to turn around Honda's ailing F1 team for 2008, has spoken candidly of how he arrived to find British-based chassis designers and Sakura-based engine builders each blaming the other for their cars' shortcomings, a situation that required him to "bang some heads". The fact was that the 'earth car' - presented in the Collection Hall with its then-fashionable 'Dumbo wings' on the nose - fell short of the required quality in both departments. Its successor, designed under Honda's auspices and a product of collaboration between the UK and Japan, was a runaway winner in 2009 - albeit under Brawn's name after Honda quit. 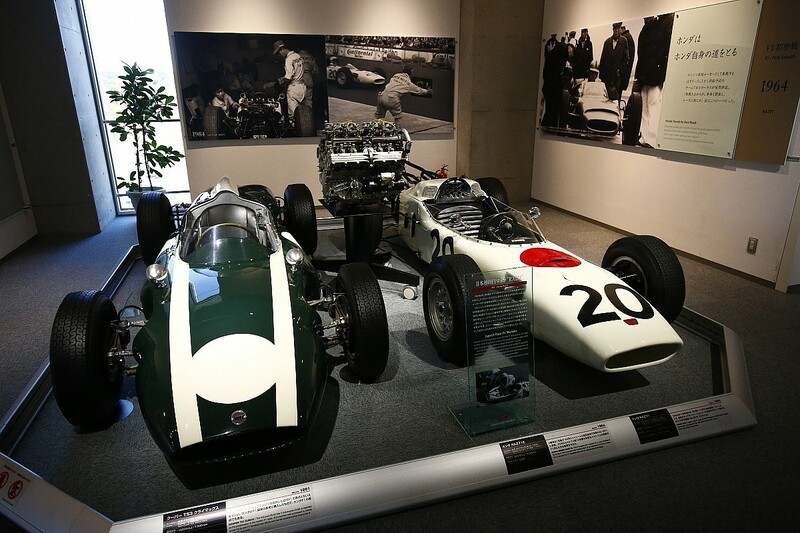 The fascinating selection of F1 cars in the Collection Hall aren't the only examples of Honda's often quixotic creativity at work; there's the motorcycle rocking a V4 engine with oval pistons, for instance, or the baby road car that came with a motorised scooter (complete with fold-down handlebars) in the boot. Ask nicely and you can take a ride on a futuristic personal mobility device that looks like a motorised librarian's stool, and which you steer by leaning. So you leave the Collection Hall with the over-riding impression of a company that can't help but try things other people have never done... only to receive a sharp lesson in why they didn't. An impression, too, of an endlessly creative group of minds who can really get it together and win big - when they're all pulling in the right direction.